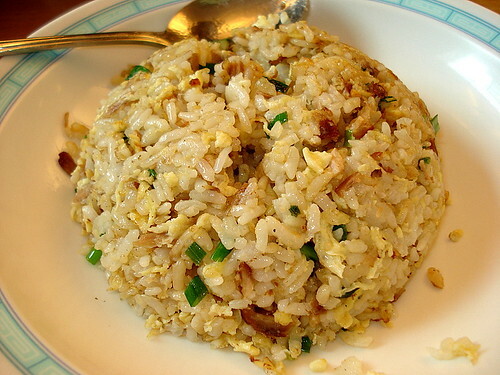 Chahan (fried rice with pork), originally uploaded by Camemberu. I have been wanting to try Ohsho's fried rice for some time. Finally today I was nearby at an off-peak hour. Seats available! I opted for the Set F (S$11) - comprising chahan (fried rice with pork), a plate of gyoza and a bowl of clear soup. They also have a different version with crabmeat and egg in thick sauce, and chahan with chicken instead of pork. The food arrived quickly. My chahan was a very large bowl, with plenty of ingredients. Yes, it was tasty but the rice was a little too moist and clumpy for my expectations - I am still looking for the Holy Grail of Japanese-style fried rice in Singapore ever since tasting a really superb one in Tokyo. Am I hoping for too much? Probably. Gyoza platter, originally uploaded by Camemberu. Quite a generous plate of gyozas, I'd say, for just an extra S$3 (the chahan on its own would have cost S$8). Ohsho has lots of condiments you can choose to pair your food with. Vinegar, chili oil, soy sauce, pepper, chili paste, chili-vinegar mix (in a large spout bottle), and hurrah, the Shichimi Togarashi chili flakes (which was recently taken off the supermarket shelves on suspicions of it containing a psychoactive component of cannabis). These go really well with all kinds of Japanese food. I doubt they'll be able to replenish the bottles though. 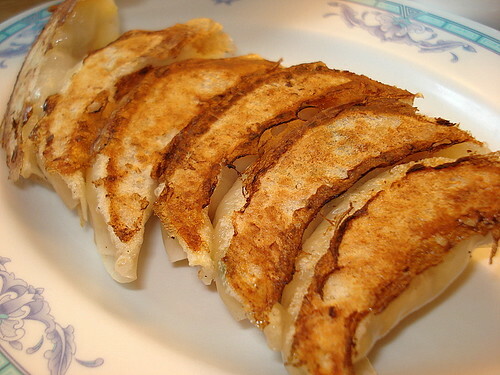 Gyoza filling, originally uploaded by Camemberu. 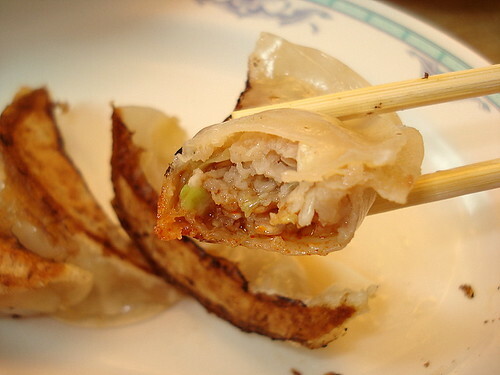 The gyoza filling is of course not as abundant as what you get in Shanghainese fried dumplings. Tastewise somewhat subtle but it was all right. However, the skin looked and tasted strangely rubbery. Not so much that it disturbed you, but it certainly wasn't the fine skin that you get at Noodle House Ken's and elsewhere. 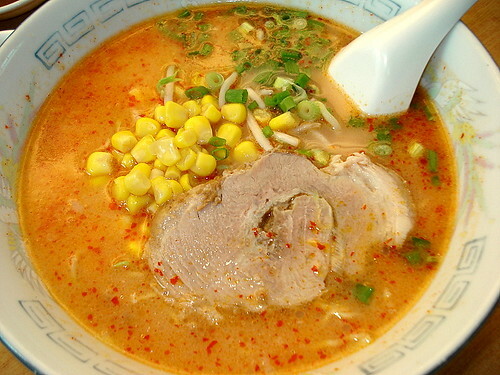 Chili Ramen, originally uploaded by Camemberu. Hubby went for a pork-based spicy chili ramen (he almost didn't actually - still traumatised by the Tampopo experience. The Ohsho version (S$10) turned out to be decent even though not terribly spicy. At first I was not too impressed with the broth, but it slowly grew on me. Still, I think Noodle House Ken is better for ramen (even though they have far less variety). Now I only need to try Ken's fried rice (although I hear Ohsho's better in this regard). Ohsho is a really open and small shop with a long counter and just 4-5 small tables in front. Service is quick and I like that ice water comes freely available on the table (as is common in ramen shops in Japan, so I hear). Foodwise, there is something decidedly "homely" about Ohsho's cooking. To me, it really tastes like Chinese home-cooking for some reason, even though it's meant to be Japanese-influenced (with a real Japanese chef behind the counter at that). But with prices that are quite accessible (and no service charge or GST to boot! ), it's not a bad place to come to once in a while. hello! I quite like the chahan here, it's tasty 'cos of the chashu that they use. The ramen is not so good though. Hmmmm looks delicious. OHSHO is one of biggest Chinese-foods franchise group in Japan. 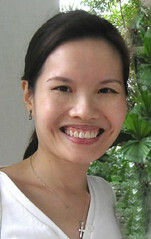 Is OHSHO in Singapore as you described belongs to it or individual invested restaurant? I think it is, as long as Yoshinoya have branch in Singapore. Do you know Yoshinoya? They served sooooooo delicious gyudon. Oh yes, we have many Yoshinoya branches here, but probably not as tasty as the ones in Japan. Still, they make a nice gyudon!